Times 4 - West Coast Tour - Live at D'Anbino's Vineyards in Paso Robles, CA, Oct 11, 2014! 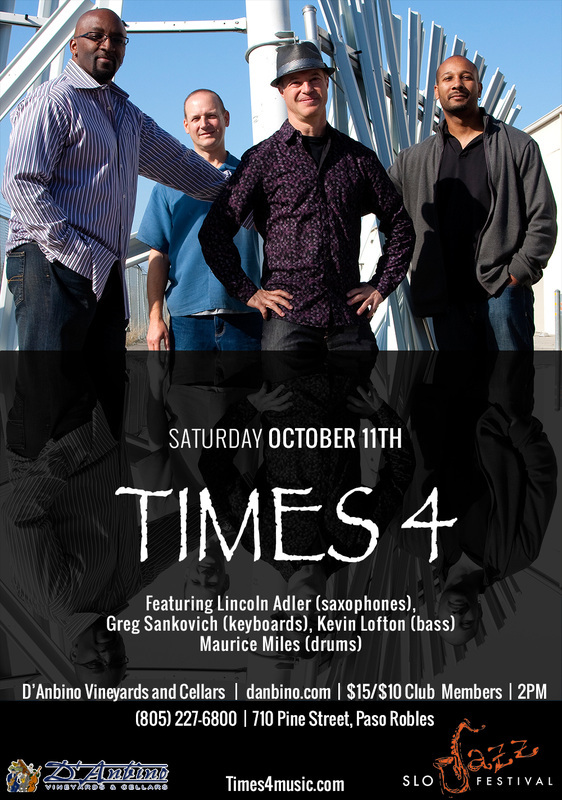 Times 4 - live at D'Anbinos Vineyards and Cellars music room on October 11, 2014, as a special joint production by SLO Jazz Festival, D'Anbino's Vineyards and Cellars. This featured show, part of Times 4's West Cost Tour will take place from 2PM - 4:30PM on Saturday, October 11, 2014. Tickets available by calling D'Anbino's at (805) 227-6800. Tickets: $15 for this show - or $10 if you are a MEMBER of SLO Jazz Festival or D'Anbino's Wine Club. Learn more at: http://times4music.com.